I read all of the reviews and compared a couple different battery powered options, but ultimately chose this one. This machine does not have a plastic needle guard (some other models do), and it comes with a foot pedal (the reviews on a different model claimed theirs didn't have one!). I read the manual as soon as the machine was delivered. The manual was very thorough and addressed several concerns. It even shows how to take apart the machine and repair things that may break! I highly recommend reading the manual before touching the machine if you buy one. 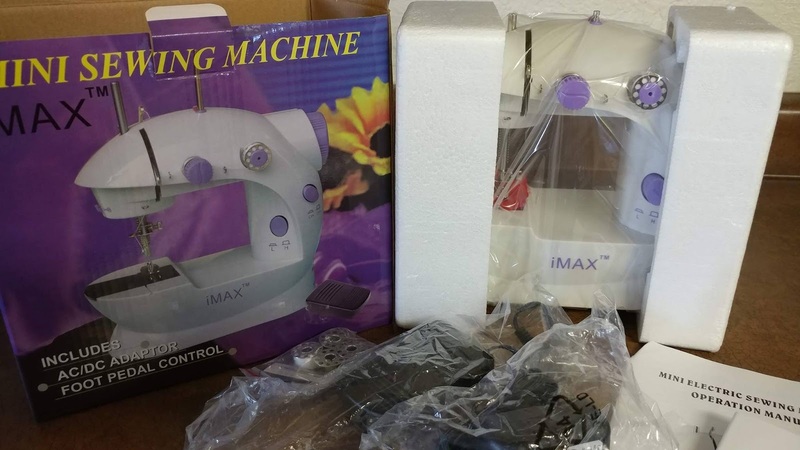 For example, the machine comes pre-threaded, and although the tension seems ridiculously too tight, the manual says it's perfect right out of the box for the way this sewing machine operates. After sewing with it, I agree. It doesn't make sense to me, but it sews best if left untouched. I'll be honest, I had really low expectations for the machine. I mean, it's made in China, it's basically $20, it's a no-name brand, and it's barely bigger than a Kleenex box. You can not adjust stitch length, it only has "low" or "high" speed, and the machine is either ON (actual stitching) or OFF. I actually didn't expect it to even work out of the box. 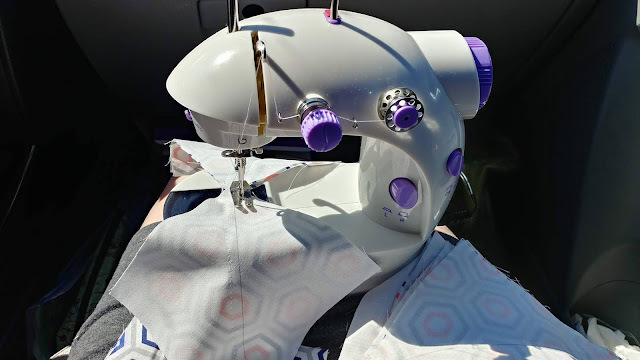 I tested it out at home before our trip, and I was pleasantly surprised that it actually did sew! It even has a light you can turn on to light up the needle area! It can be used with four AA batteries or plugged in to a standard wall outlet. 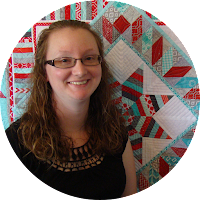 I switched out the thread for Aurifil 50wt and was eager to try it out on the go! I waited until well into our trip to try it out. 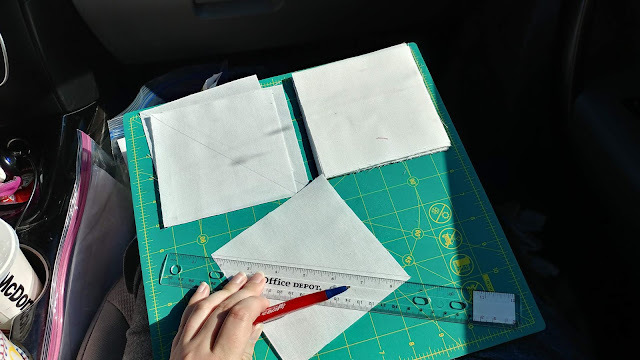 Earlier in the day, I drew diagonal lines on some squares I had cut at home so I could make HSTs (half square triangles). The presser foot on the machine does not have straight sides, so I had to aim for 1/4" on my own. 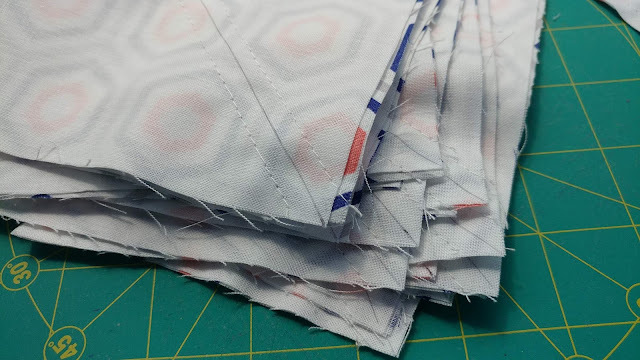 I was glad I cut my squares oversized and planned to trim my HSTs down later so I didn't have to have perfect 1/4" seams. When evaluating the stitch quality, I did notice that there are often some skipped stitches. However, it's not often enough to effect the durability of the seam. I haven't sewn enough to know how long the batteries will last. However, the machine is actually switched OFF when sewing with the foot pedal. So power is only supplied when the pedal is pressed and the machine is sewing. I also have not used it with the light on, so that will help conserve the batteries too. I made 40 HSTs using the machine. Not a huge amount, but enough to know that the machine is a keeper! 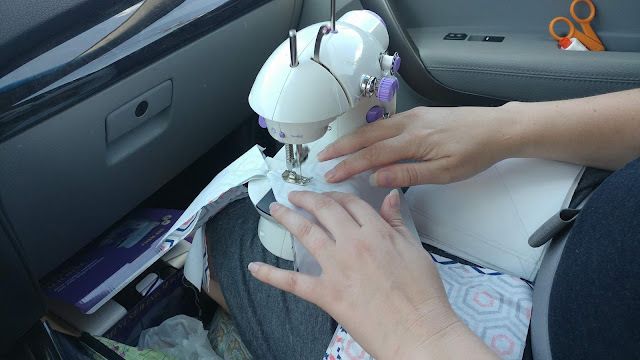 It is great for on-the-go sewing when electricity isn't available. It's also best for when accurate seams/perfection isn't necessary. It's definitely not the same quality as my Bernina or Singer featherweight, but it has it's place. Please note: Sewing in a car can be dangerous. 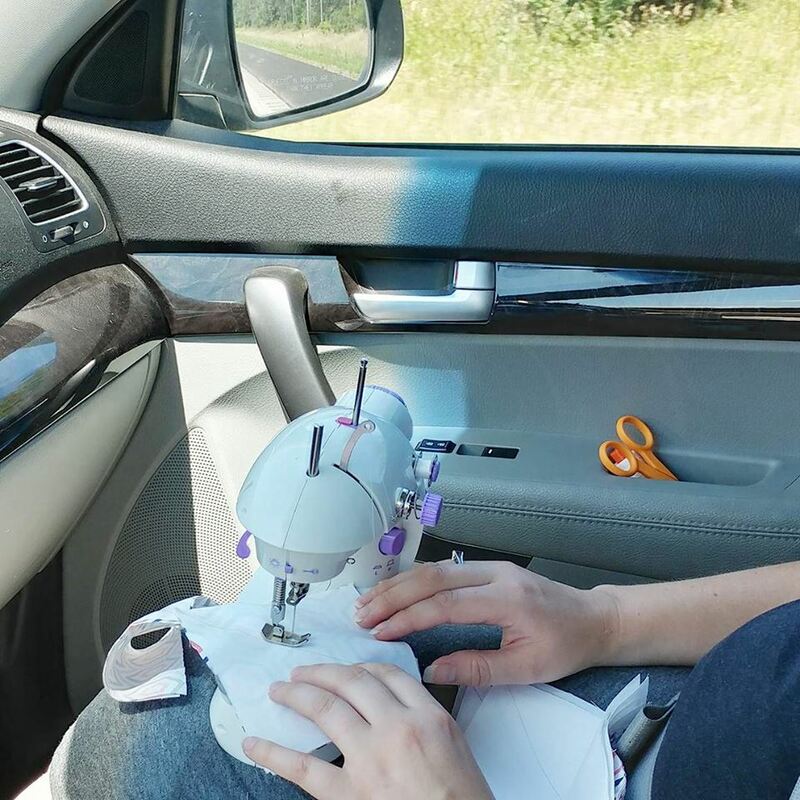 If sewing in the front passenger seat, you may want to turn the passenger air bag off. 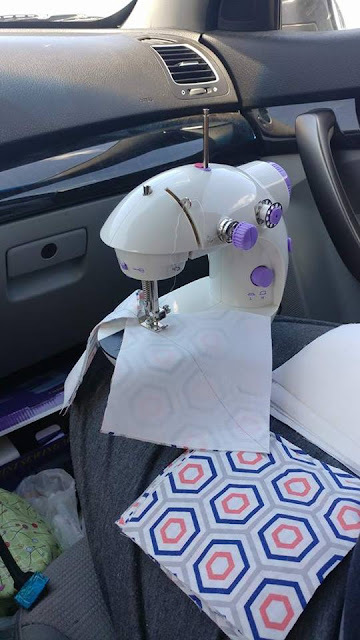 If you were to be in an accident, holding a sewing machine (or anything for that matter) could be quite dangerous to yourself or to others in the vehicle. The backseat might be better if you have the option. I am excited for the possibilities of having a battery-powered sewing machine! This would make sewing on a boat or train possible! It would also be useful during a power outage. One day, I hope to add a treadle and/or hand crank machine to my collection too! For my regular passenger rides, I'm going to stick with hand sewing hexies. But for longer road trips, I'm glad I have another option now! 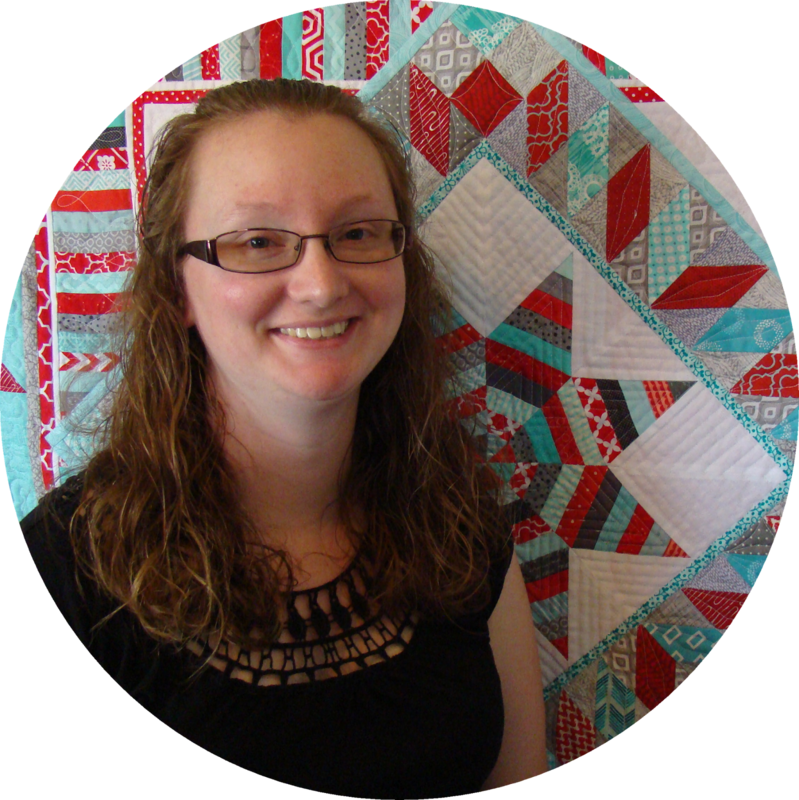 Do you have a travel sewing machine? 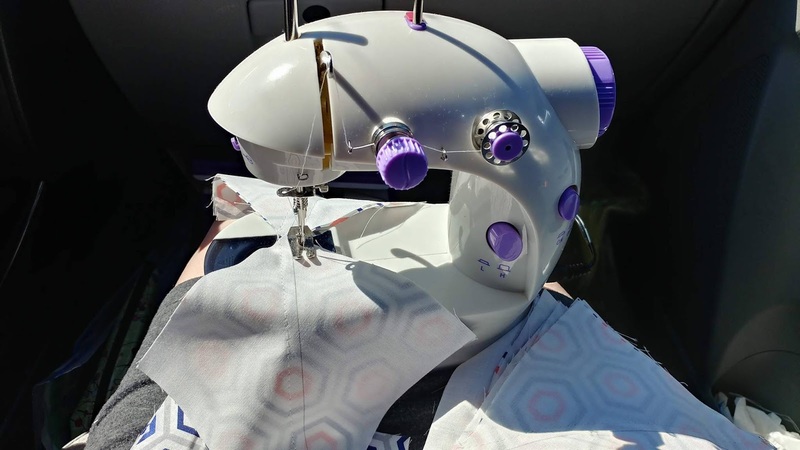 Have you ever sewn on the go with a machine? 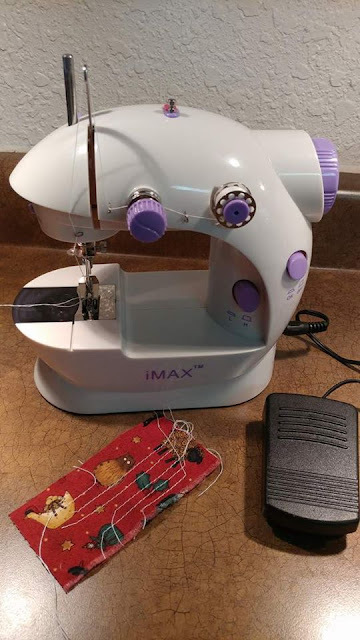 If nothing else, this sounds like a small, lightweight travel machine for those times when you want to have something to sew on but don't want to lug the big, expensive, heavy machine with you! I was definitely looking forward to hearing how this worked for you and I am fascinated by the machine. I loved hearing your thoughts on this machine. It's so cute! It seems like it could be great for a day of string piecing if you were going somewhere and didn't want to lug a big machine. 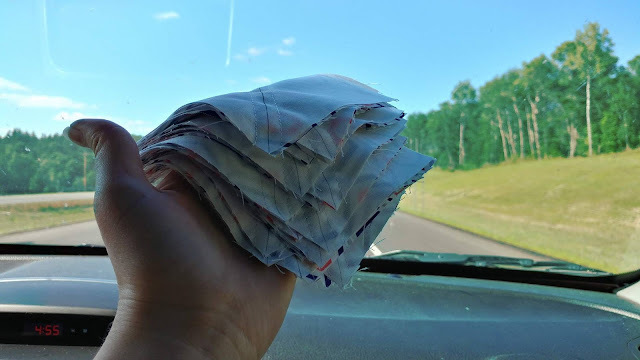 How fun to have a pile of HSTs at the end of your car ride! "This would make sewing on a boat or train possible!" I now have Green Eggs and Ham in my head. Would you sew on a boat with a goat? Would you sew on a train in the rain? You just need one of those trays like at McDonald's that they put your food on! I actually picked up a couple of them at the $1 store for me and my husband as lap trays. They're cute and melamine. You'd probably have to put some of those command strips on it. Wow. This one sewing machine looks amazing with its lightweight and portability. I hope that having a long travel, this will be a good companion for girls. Quite the deal/entertainment for $20! Thanks for sharing your thoughts and experience. Very interesting. Thank you for the review. Couldn't get the video to play but I can imagine. For $20 or so it sounds like a good investment. What kind of batteries does it use? She wrote in the article that it takes 4 AA batteries. You will find the services of Vietnam www.greenvisa.io services friendly and professional assisting you throughout the entire procedure from online application to Vietnam visa on arrival. I've been excited to see your review since you posted that you were trying this out! I'm now seriously considering this machine. 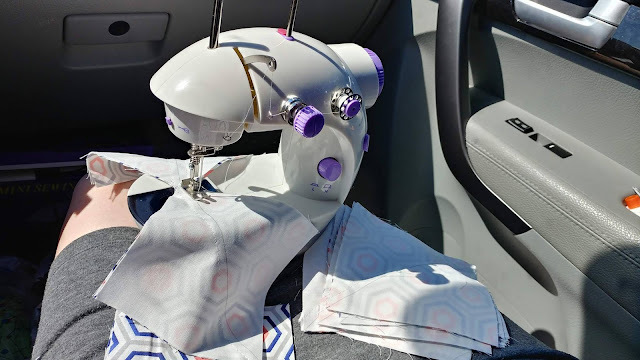 I'm not sure how well the noise would go over in our car on family trips, but having a small option to travel with would be neat, and I love the idea of actually being able to sew in the car. Thanks for the review and the idea! Glad it worked out for you and no air bag was deployed during the demo! So thusly your cash could be spared by you as it were. Aside from this component of a best travel office, travel specialists can oftentimes organize outstanding and unprecedented rich offices for their customers that would increase and make their excursions all the more energizing and improved.